A novel way to synthesize gold nanoparticles based on the use of N-alkylaminopyrazole is shown. This ligand has a triple functionality: induces AuNPs formation, stabilizes the formed nanoparticles, and even remains available for an external coordination with heavy metal ions with interest for environment monitoring. (Figure 2, left & up) The availability of N-alkylaminopyrazole ligands onto the AuNPs surface is studied using UV-Vis and NMR techniques. The mechanism of formation of AuNPs along with the synthesis optimization and characterization are studied using voltammetry and UV-Vis, and the results are discussed in detail. The application of N-alkylaminopyrazole-derived gold nanoparticles in the heavy metal ions sensing is also tested showing a high sensitivity for mercury detection at low concentration level. The functionalization of metal nanoparticles with these receptors followed by heavy metal ions detection represents a simple “mix and detect” approach with interest for several other sensing applications besides environmental monitoring. The detection of heavy metals using electrochemical stripping analysis and screen-printed electrodes (Figure 2, right-down) with interest for environment monitoring (ex. accidental pollution of sea water etc.) represent an important research line given the importance in obtaining stable and autonomous devices for such kind of applications. Infectious plant diseases are a main issue worldwide due to their high-impact on agriculture and crop productivity. They can be caused by fungi, viruses, bacteria, viroids, phytoplasma and nematodes. Early detection of plant pathogens could lead to a faster and more effective treatment of such infections, reducing the environmental and economic costs triggered by them. Some immunological (i.e. ELISA and DTBIA) and DNA-based technologies (i.e. PCR, RP-PCR and dot blot) are already being used for plant pathogens detection. Nonetheless, these methodologies often require expensive laboratory equipment as well as time-consuming procedures. Therefore, there is an increasing demand on cheaper, faster and lab-on-a-chip biosensors for plant diseases monitoring. In this review , Merkoçi’s group describes a wide range of biosensors such as antibody-based biosensors (i.e. electrochemical and optical/AuNPs immunosensors), enzymatic-based biosensors (i.e. voltammetric detection) (Figure 3) and DNA and phages-based biosensors (i.e. optical/magnetic/ fluorescent tag biosensors), as well as studies the most important commercial available related kits available on the market. Most organic toxic compounds (i.e. pesticides) are difficult to be detected by means of antibodies and aptamers mainly due to their small size. Consequently, there is an increasing need for the development of sensitive biosensors able to detect such molecules. Merkoçi’s group has developed a multifunctional composite biosensor composed of magnetic silica beads, graphene quantum dots and molecularly imprinted polypyrrole (mSGP) . 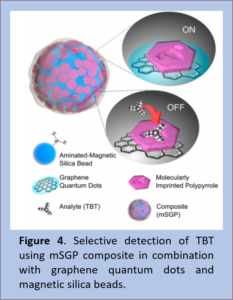 On the one hand, mSGP is able to specifically and selectively detect small molecules such as a tributyltin (TBT, chosen as a model analyte in this article) thanks to its magnetic and optical properties that allow analyte preconcentration. On the other hand, graphene quantum dots provide a switch on-switch off photoluminescent response in response to TBT concentration and magnetic silica beads allow magnetic separation (Figure 4). This novel biosensor has been tested in water and seawater, obtaining a LOD of 12,78 and 42,56 ppb, respectively, and could be possibly used for different organic pollutants detection. Another approach to detect TBT relies on molecular imprinted polymers (MIPs), which are highly effective polymers for chemical compounds detection . 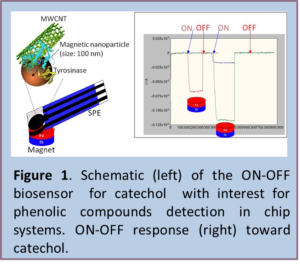 The combination of MIP composites and Fe3O4 magnetic nanoparticles provides a user-friendly sensor that enables selective separation and preconcentration of the analyte as well as a fast impedimetric measurement for TBT quantification (Figure 5). A limit of detection of 5 pM and a limit of quantification of 18 pM have been achieved, showing wider detection ranges than most of the systems found in the literature as well as one of the lowest LODs. The high sensitivity given by this biosensor comes from the selectivity of the MIP used for its construction. Finally, MIP- Fe3O4NPs composites showed robustness and stability for electrochemical pesticides detection in real matrix, such as sea water. 1) Gemma Aragay, Josefina Pons, Arben Merkoçi, “Recent Trends in Macro, Micro and Nanomaterials Based Tools and Strategies for Heavy Metals Detection”, Chemical Reviews, 111 (5), 3433-3458, 2011. 2) Gemma Aragay, Flavio Pino, Arben Merkoçi, “Nanomaterials for Sensing and Destroying Pesticides”, Chemical Reviews, 2012, 112 (10), pp 5317–5338. 3) Briza Pérez-López, Arben Merkoçi, “Magnetic Nanoparticles Modified with Carbon Nanotubes for Electrocatalytic Magnetoswitchable Biosensing Applications”, Advanced Functional Materials, 2011, 21, 255–260. 4) Carmen C. Mayorga-Martinez, Miquel Cadevall, Maria Guix, Josep ROS, Arben Merkoçi, “Bismuth nanoparticles for phenolic compounds biosensing application” Biosensors & Bioelectronics, Biosensors and Bioelectronics, 2013, 40, 57–6. 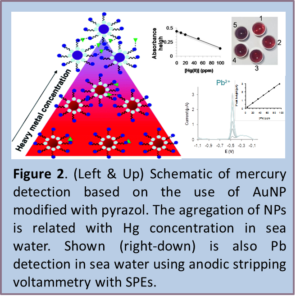 5) Gemma Aragay, Josefina Pons, Josep Ros, Arben Merkoçi, “Aminopyrazole based ligand induces gold nanoparticle formation and remains available for heavy metals sensing. A simple ‘mix and detect’ approach.” Langmuir, 2010, 26 10165–10170. 6) Mohga Khater, Alfredo de la Escosura-Muñiz, Arben Merkoçi. 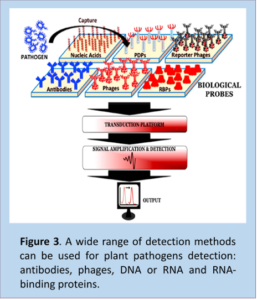 “Biosensors for plant pathoen detection”. Bioesnsors and Bioelectronics, 2017, 93, 72-86. 7) Erhan Zor, Eden Morales-Narváez, Alejandro Zamora-Gálvez, Haluk Bingol, Mustafa Ersoz, Arben Merkoçi. “Graphene quantum dots-based photoluminescent sensor: a multifuncional composite for pesticide detection”, Applied Materials & Interfaces, 2015. 8) Alejandro Zamora-Gálvez, Carmen C. Mayorga-Martínez, Claudio Parolo, Josefina Pons, Arben Merkoçi. 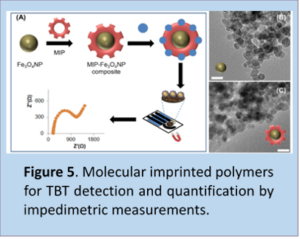 “Magnetic nanoparticle-molecular imprinted polymer: a new impedimetric sensor for tributyltin detection”. Electrochemistry Communications, 2017, 82, 6-11.